Until the Fitbit smartwatch turns up, the Blaze is the closest thing we have from the fitness tracker maker that resembles a watch. Since the Blaze launched back in 2016, it's been joined by the Fitbit Charge 2, Fitbit Flex 2 and the Fitbit Alta (and HR). Software upgrades continue to roll out to the Blaze to help make the watch-looking tracker a great option. While it's one of the more intuitive fitness trackers to use, it's easy to miss some of the modes and features Fitbit has included and added over time to make it more useful. So if you've picked up a Blaze or thinking of picking one up in the near future, there are plenty of tips and tricks to get more from your shiny new Fitbit. From tapping into your phone's GPS, improving sleep or getting the most from the notification support, here are the essential details all Fitbit Blaze owners should know. Annoyingly, unlike the Fitbit Surge, the Blaze doesn't have GPS built-in. That doesn't mean you can't track your running or cycling activity though, as you can harness the GPS from your phone. To do it, first make sure GPS and Bluetooth are enabled on your phone. Next, go to the Exercise screen on the Blaze and next to each tracked activity you'll see a small cog. Press it and select 'Use Phone GPS' to enable ConnectedGPS, Fitbit's workaround for devices without the ability built in. Out of the box, the Blaze offers running, cycling, weight training, treadmill running, elliptical training and workout as default modes for exercise tracking. You can add or remove exercises that appear on the Blaze by heading into the Fitbit app. Click on the Blaze icon and select Exercise Shortcuts. You'll be able to add modes like yoga, kickboxing, pilates, tennis and bootcamp. The running mode is the only one that's customizable, however, allowing you to set up whether it's distance based or time based, as well as choosing the distance and time. Word of warning: you can only have seven workout modes at a time. One of the newer features added to the Blaze is an upgrade to its sleep-tracking capabilities. The Blaze can now track Sleep Stages. Using your variable heart rate and movement, it can determine whether you're in light, deep or REM sleep. It'll also serve up daily sleep insights for how to get a better night sleep. That includes letting you know how the larger Fitbit community is sleeping. To see your metrics in detail, tap on the individual day in the sleep section, then again for annotations that better explain what each stage means. You can also set a series of sleep goals that Fitbit will help you accomplish. If you head to the companion app, go to the sleep section and hit the tiny cog, you can set a sleep goal and a targeted sleep schedule, which include both bedtime and wake up reminders. If, for whatever reason, your run outdoors has been interrupted, there is an easy way to get tracking working again without tinkering with the Blaze. Make sure you've got the location services settings for the Fitbit app set to Always and when you track through Fitbit's MobileRun mode, it'll automatically resume tracking. Which wrist you wear the Blaze on can have an big impact on the kind of data you collect during the day when you're up and moving. The Fitbit app sets the default to wearing the tracker on the non-dominant hand. If you wear it on your dominant hand (the one you write and eat with), you can adjust that in the Blaze settings on the app. This means the Blaze can account for the extra movement. There's another thing you can do as well to improve accuracy, and that's measure stride length. You can do this by finding somewhere you know the exact distance and counting the steps, then dividing the total distance taken by the number of steps to get your stride length. You can then add that data in the app. Just head to Account, then scroll down to Advanced Settings and add it in under 'Stride Length'. Which Fitbit tracker should you buy? If you need a gentle little nudge in the morning to wake up or to give you a nudge during the day, this staple Fitbit feature is also present on the Blaze. To set one up, jump into the accounts tab on the Fitbit app and find the Blaze icon. Select Silent Alarms and then set up a new alarm. When the alarm activates, you can tap the ZZ icon and it won't bug you until 9 minutes later. Some of the interactive clock faces on the Fitbit Blaze are better fits on the screen than others. If you don't like the one that comes as default, you can change it. You can't do it on the Blaze itself, instead you need to go into the Fitbit app. Click on the little Blaze icon up at the top and select "Clock Face." You'll be presented with 12 different faces, from digital, Fitbit-y styles to more traditional analog styles. Choose one, click the back arrow up at the top and re-sync your watch to update it with the new face. Phone notifications are controlled from your phone, and for those who can't switch off from the outside world to focus on a gym session, you can view notifications while you're tracking exercise in the multi-sport mode or during a FitStar workout. Simply press and hold the lower right button to view notifications. For checking in on the music controls, perform the same action on the upper right button. The Blaze is no longer just a text message, call log and email notification machine. Now, it can tell you about your latest Facebook notifications, tweets, news, sports scores and more. The problem, however, is that they're turned off by default. To enable them, head to the companion app and click on the Blaze icon. Click on 'Notifications' and then select 'App Notifications'. You'll be greeted by a list of the apps on your phone that can serve notifications to your Blaze. Turn them on, or off, at your leisure. Spend too much time at your desk? Your Blaze can help out with that. In the companion app, click on the Blaze icon and find 'Reminders to Move' right under 'Notifications'. Not only will you be able to turn on reminders to move, you'll be able to choose a notification window so that you can tailor it to your work day. During this window, the Blaze will remind you to move 10 minutes before the hour if you haven't reached 250 steps in the previous 50 minutes. If you don't want to take the manual route to improving accuracy, Fitbit has introduced a way where stride length is automatically detected. All you need to do is make sure the Connected GPS mode is enabled on your phone and when you start tracking, the software and hardware will detect stride length for you. Nodding off with the Blaze means you can keep a closer eye on whether you're getting enough shut-eye. There is a way to make sure sleep tracking picks up more accurate data. Head into the advanced settings inside the app, which can be found under the Account tab. Here you'll find the option to change sleep sensitivity to sensitive to improve the detection of your movements at night. One of the Blaze's biggest features is being able to swap out the bands and put the tracker into another frame, and it's all pretty easy to do. Simply push the tracker through the frame and it'll pop out letting you clip it into another one. Just make sure the buttons are lined up with the ones on the frame. You'll quickly notice if you haven't done it right. To swap out a Fitbit Blaze band, flip over the watch and locate the quick release bars. Slide them across and pull off the band. Now you should be able to pick out another style to match up with your dashing ensemble. 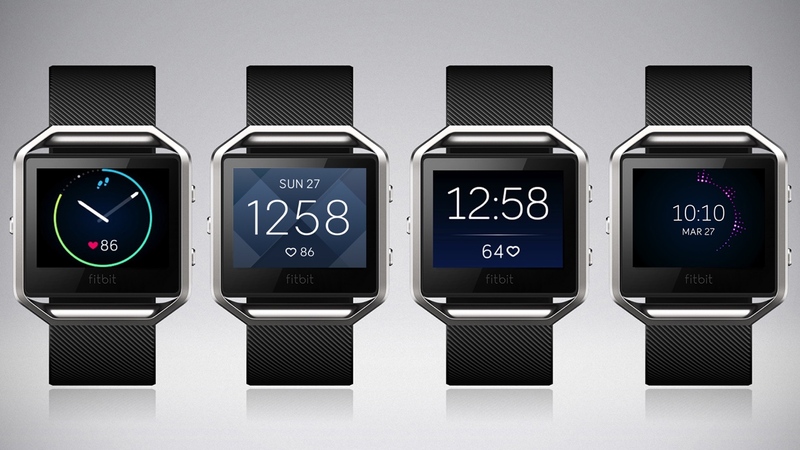 You can check out all the different Blaze designs over in the Fitbit lookbook. The Fitbit app is one of the best around for viewing progress, but if you really like the tracking apps you already have then there is a way to bring the two closer together. Fitbit has a long list of supported apps and MyFitnessPal is a great alternative for food tracking if you don't think Fitbit's approach is up to scratch. To link the two, head into the MyFitnessPal app and select the More tab. Here you'll find an Apps & Devices section where you can pick Fitbit out from the list of apps and then click Connect to start feeding nutritional data into the Fitbit app. The Fitbit Blaze unfortunately doesn't work exactly like a normal watch. It's notably lacking an always-on display. You have to double tap on the screen or press the button on the left of the frame to turn it on. But if you're in the middle of your workout and you don't want to fiddle around with the buttons, there is a solution. Fitbit has included a Quick View mode, which you can activate by swiping through the screens on the Blaze to the settings menu. Here you'll be able to turn the mode on, waking up your screen every time you flick your wrist toward you. Like the Fitbit Charge HR, the Blaze will let you work out in specific heart rate zones. This can give you a clear indication about the intensity of your workouts. Out of the box, heart rate zones (Peak, Cardio and Fat Burn) are based on a maximum heart rate of 220 bpm minus your age. Here's a simple breakdown of what those zones mean. Fat burn - This is a low level zone which is good place for exercise beginners to start and is when a higher percentage of calories are burned from fat. Cardio - Now you are starting to push yourself, increasing cardiovascular fitness and this is where most people should target. Peak - If you're planning on training hard, these are those intense sessions where you're taking the body out of its comfort zone. If you're not happy with the heart rate zones set up, you can create a custom one in the Heart Rate Zones section in the Fitbit app. Still bamboozled by what it all means? You should definitely check out our breakdown guide to heart rate zone training. This activates Cardio Fitness Level, which will compare your fitness level to people the same age and gender as you. You'll also get to see how you compare to professional athletes. It's a good way to get a quick idea of where you are and where you need to go. Once you go on a couple runs, just head to the Heart Rate section of the companion app and swipe over to Cardio Fitness Level. If you've got a busy and stressful day, your Blaze can help you take a moment to yourself. All you have to do is activate Relax guided breathing in the main menu of options. You can choose between a two-minute or five-minute session, which uses your heart rate to give you a customized breathing routine. The Blaze manages up to five days battery life and that's pretty much what we've found living with it. There are some ways to eek a little more life out of the tracker though. Some obvious things to do are to reduce the screen brightness and turn off automatic heart rate tracking, which can be done from the Settings menu on the Blaze. Turning off phone notifications will definitely help here as well. You can also turn off All-Day Sync from within the app, so the Blaze is not continually syncing activity tracking data throughout the day. If you're having issues with the Blaze, there is a way to restart it. It won't delete data but it will clear phone notifications. To reboot, press and hold the single physical button on the left and the bottom right button until the Fitbit icon appears on the screen. This should take less than 10 seconds. Let go of the buttons, and hopefully, everything should be back to normal.